Since January 2009, nearly 5.9 million Americans have been added to the Social Security Disability Insurance (SSDI) program. The program provided $119 billion in benefits to 8.3 million disabled workers in fiscal year 2011—that’s a six-fold increase from 1.4 million in 1970. Including the dependent spouses and children of those workers further increases the number of people receiving support in 2011 to 10.3 million. Disabled workers received an average monthly benefit of $1,111, as of August 2012. While SSDI is designed to provide a safety net to people who are physically restricted in their ability to find work and provide for themselves, a recent Senate committee investigation alarmingly calls into question the process of approving disability claims and rewarding benefits. The report found that a quarter of agency decisions in the claims approval process for federal disability benefits failed to properly address insufficient, contradictory, and incomplete evidence, thus increasing the chances of rewarding nondisabled persons. It also found vast misuse of medical listings, where the agency failed to demonstrate how a claimant met each of the required criteria in the Social Security Administration’s (SSA) medical “Listing of Impairments” to qualify for the disability program. For each person wrongly added to the disability rolls, taxpayers pay at least $300,000 (the average lifetime cost of a single disability award). The first chart uses historical data from the SSA to show the growth in disability benefits awarded and the amount of benefit terminations (per 1,000 beneficiaries) between 1980 and 2011. 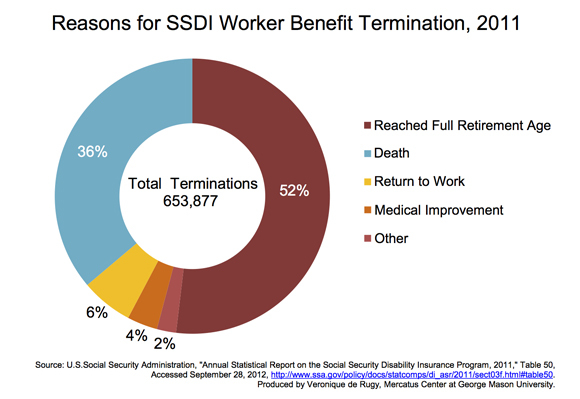 The second chart uses data from the SSA to break out the major reasons why individuals’ SSDI benefits were terminated by the SSA in 2011. Since 1980, the number of disability benefits grew by 82 percent and the termination rate fell by 42 percent. In the past decade, roughly 50,000 awards to beneficiaries were paid per year on average. Total benefits peaked at 1.7 million awards in the aftermath of the crisis, when many Americans turned to disability programs to make ends meet. The 933,597 disability benefits awarded in 1980 pale in comparison to 2011, when 1,695,780 benefits were awarded. The data also show that termination of benefits continue to fall dramatically as more and more people stay on SSDI for longer periods of time—163 per 1,000 beneficiaries in 1982, compared with 74 per 1,000 beneficiaries in 2011. The data show that, since 1999, when Clinton signed into law the work incentive improvement act, there have been ever-increasing awards and lowered termination rates, essentially increasing the scope of eligibility and costs of the program. In 1980, Congress enacted legislation to quell the surge that happened during the 1970s in increased applications and the lack of beneficiaries returning to work or rehabilitated. Such legislation limited disability benefit levels by instituting stringent reviews of claims decisions and a number of changes affecting the disability criteria. The results can be seen in the data, between 1980 and 1983, as the number of benefits awarded decline and terminations increased, a stark contrast compared with other years. Beneficiaries continue to receive awards as long as they remain disabled or until they reach the full retirement age. The data show, however, that less than 10 percent of individuals leave the disability rolls by returning to work or medical improvement. Most beneficiaries simply convert automatically to retirement benefits at the federal retirement age. Of the 653,877 benefits that were terminated, 51.7 percent were owing to conversion to retirement benefits, and 36.1 percent were owing to the death. The remaining factors include 6.1 percent who returned to work and earned above the earnings limit and 3.6 percent of those terminated had a medical improvement. This evidence lines up with research findings that shows that the SSDI program provides strong incentives for applicants and beneficiaries to remain permanently out of the labor force and hold off on terminating benefits until they’ve reached the federal retirement age or death. While weaknesses in the claims approval process is one factor that helps explain the increase in the number of disability insurance applications and awards, there are a few primary drivers to also consider: More flexibility in allowing back pain as a reason for disability, the number of women now claiming disability insurance, and the economic recession. Whatever the reasons, the current trends are disquieting: more backlogs in the application and awards process, the increasing rate of trust fund exhaustion, and an increasing burden to taxpayers and the disabled. Data Notes: The termination rate estimates follow SSA convention, measured per 1,000 beneficiaries. Benefit estimates are measured as the total number of awards to beneficiaries in a given year. The numbers for total awarded benefits and costs (Chart 1 and Supplemental Chart) include all workers, spouses, and children receiving SSDI payments.